The purpose of input validation is to help your respondents provide the desired answers in the expected format. It is an aid, and it is not designed to be foolproof. There are ways one can bypass the validation and, although rare in a normal use case, invalid responses should not be unexpected. Note: It is not suggested to use more than one validation type per field. All validation rules can be accessed by clicking on a field, selecting Options and then selecting Validation Rules from the left-side option menu. This option allows you to set the maximum characters or words to be allowed in a text field. You can only define a limit for characters or words and not for both. Users can be required to fill out a given field before submitting or proceeding to a form's next page. Select Validation Rules from the sidebar. Check the corresponding box for This is a required field. This can also be accomplished by clicking the Req'd icon after clicking on a field in your form. Select a text input question and click the Options button to open the editing sidebar. In the Expected Input Format menu, select Email. Note: An underscore in a domain of an email is most-likely a human error but FormAssembly's email validation will allow it to pass. However, Salesforce's validation will not accept the format of an underscore in the domain of an email. Note: Email Validation will allow multiple email addresses separated by commas but Salesforce will throw an error if it is pushed to Salesforce as it only expects one email address in that field. Select a text input question and click the Options button to open the editing sidebar. Or, you can select your question with the sidebar open. In the Expected Input Format menu, select Number [0-9]. Enter the lower number in the From field and the higher number in the To field. Select a text input field and click the Options button to open the editing sidebar. In the Expected Input Format menu, select Date, Time, or Date and Time. Select the Date (with calendar) option if you'd like to allow respondents to use a calendar to select the date. Enter your beginning date in the From field and your ending date in the To field. Create your own formatting rules by using regular expressions, creating an automatic format, or by limiting the number of characters that can be entered into a field. Create your rules in the corresponding fields. The auto-formatting can be used for a more simple pattern, such as a phone number or serial number. For instance, let's say you have a serial number field and all of the serial numbers expected to be entered on your form start with M4K, then have 4 numbers and 2 letters. The mask would be M4K####$$, with # = numbers and $ = alphanumeric characters (letters or numbers). Characters like commas, slashes, and dashes will all act like M4K and only function as place holders. The expected format will be visible once the field is selected. Note: The Auto-Format with a Mask feature does not work reliably on Android phones. The best alternative would be to use a regular expression instead. Please contact support with any questions. Regular expressions can help you define an expected pattern. 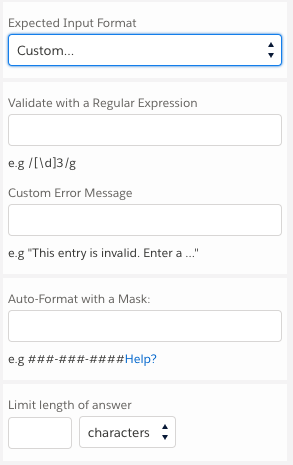 Crafting regular expressions can be difficult. It is usually best to copy & paste an existing expression than trying to come up with your own. While we'd like to provide as much support as we can, we are unable to support expressions as they can break in ways we cannot predict such as when updates are made.